Would you like to have met Abraham Lincoln and had a discussion about his life and career? Can you imagine what George Washington would have said if he was interviewed about his achievements? 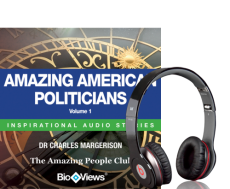 In this collection of great short audio stories, meet Lincoln, Washington, Jefferson and Franklin, who are of course among America's most influential people and really helped shape the nation we know today. Their lives have been documented time and time again however this new collection of audio stories brings them to life through BioViews. It is as if they have come back and given an account of their life, explaining their major challenges and achievements in the context of their family life and society. BioViews® are short biographical stories, similar to interviews. These unique stories provide an easy way of learning about amazing people who made major contributions and changed our world.